Islamabad: Kuwait Fund, Wednesday, expressed strong resolve to extend a supplementary loan to Pakistan for the completion of Golen Gol Hydropower Project. In this regard Kuwait Fund inked an agreement with Economic Affairs Division here. As per agreement Kuwait Fund will provide $ 15 million for the completion of the said project. The State of Kuwait has already been co-financing this Project with an amount of K.D. 11.00 million (equivalent to US$ 37.00 Million). Golen Gol Hydropower Plant (GGHPP) is a hydroelectric power plant located on Golen Gol River – a major left tributary of Mastuj River in Chitral District of Khyber Pakhtunkhwa province of Pakistan. The dam is located approximately 25 km from Chitral city, and 365 km from provincial capital of Peshawar. Construction of Golen Gol project began in 2011 and completion date was January 2018. 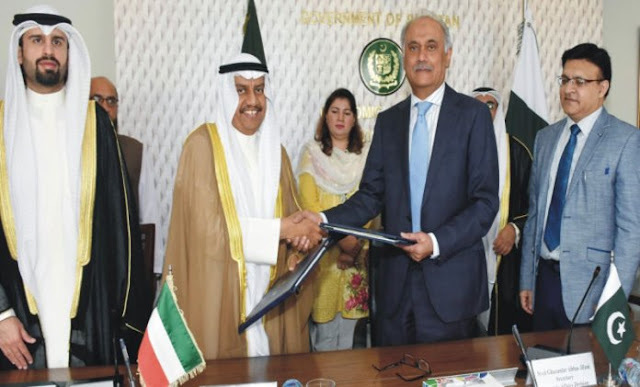 Deputy Director General Kuwait Fund for Arab Economic Development (KFAED) Ghanem Sulaiman Al-Ghenaiman signed the document on behalf of the Kuwait Fund while Secretary, Economic Affairs Division Syed Ghazanfar Abbas Jilani signed it on behalf of the Government of Pakistan. The ceremony held at Economic Affairs Division was attended by Fawaz Al-Adasani, Assistant Regional Manager for East, South Asia and Pacific Countries of Kuwait Fund, Fahad Al Mazeel, Charge d Affairs, Embassy of the State of Kuwait and senior officials from Economic Affairs Division, Ministry of Water Resources and WAPDA. Secretary, Economic Affairs Division on the occasion said that completion of the Golen Gol Hydroelectric Power Project will offer new opportunities for the people living in Chitral and Khyber Pakhtunkhwa (KP) province. It will meet electricity demand in the area and also boost tourism and economic activities.